The Repair Depot (RD) No. 8 was a component of the Commonwealth Air Training Plan during the Second World War. Built in 1940 by the Bird Company at a cost of around $450,000, the large complex near Stevenson Field was located in the then-municipality of St. James, now a suburb of Winnipeg. The site featured seven huge repair hangars, two lean-to’s measuring 112 by 128 feet each, headquarters building, mess buildings, inflammable storage buildings, several workshops, garages, and assorted other structures. Its proximity to the Air Observer School No. 5 allowed for close integration and efficient aircraft repair. Construction of the site involved around 300 labourers. Completed by October 1940, control of the facility was turned over to the Royal Canadian Air Force in mid-October and the site opened officially on 1 November 1940. When operating at full capacity, the base held the record of turning out more work per individual than any other Repair Depot in Canada. In addition to routine repair and overhaul of aircraft and engines, base personnel also salvaged plane wrecks and converted aircraft for specialized use, such as refitting three Norsemen planes into flying hospitals and modifying five Liberator bombers into transport planes. The base ceased operation on 15 March 1946, at which time part of the site hosted an emergency housing community known as Jameswood Place. Buildings were gradually sold and removed or demolished through the early 1950s. 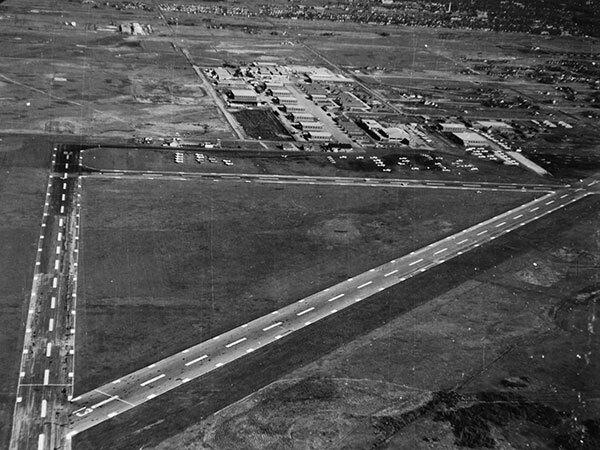 The site was vacant by late 1954. Source: Archives of Manitoba, Charles J. Gingras Collection #118. “Work to start at once on an Air Observer School,” Winnipeg Tribune, 22 June 1940, page 21. “Work to start at once on Air Observer School,” Winnipeg Tribune, 22 June 1940, page 21. “Repair Depot contract goes to Bird Co.” Winnipeg Tribune, 4 July 1940, page 13. “Trade Board report shows steady gain,” Winnipeg Tribune, 13 July 1940, page 17. “Saskatoon’s huge Air Training School to open in month,” Winnipeg Tribune, 16 August 1940, page 11. “Take over,” Winnipeg Tribune, 18 October 1940, page 5. “War contracts in West cities,” Winnipeg Tribune, 22 October 1940, page 16. “Prairies’ wide open spaces cradle air armada,” Winnipeg Tribune, 30 December 1940, page 42. “Polish flier among group attached to Repair Depot,” Winnipeg Tribune, 13 January 1941, page 11. “Victory Loan torch,” Winnipeg Tribune, 30 May 1941, page 15. “Repair Depot has new O.C.,” Winnipeg Tribune, 3 December 1941, page 12. “Beaumont is C.O. No. 8 Repair Depot,” Winnipeg Tribune, 23 May 1943, page 11. “Biggest R.C.A.F. Church parade,” Winnipeg Tribune, 29 May 1943, page 25. “Around the town,” Winnipeg Tribune, 26 April 1944, page 11. “Church parades at Air Depots,” Winnipeg Tribune, 16 December 1944, page 17. “Commonwealth Air Training Plan marks fifth birthday,” Winnipeg Free Press, 29 December 1944, page 23. “Air Units hold mass service of Thanksgiving,” Winnipeg Tribune, 20 August 1945, page 7. ““Airplane hospital,” 8 R.D. closing soon,” Winnipeg Free Press, 16 February 1946, page 5. “R.C.A.F. auction sale,” Winnipeg Free Press, 28 February 1946, page 2.